These are really simple, probably not authentic but never the less taste really great. I cook them on a reusable liner straight on my simmering plate of my blue AGA but they can also go on the BBQ or a griddle. I serve mine with a ribbon salad and coconut and chilli rice. Start by soaking 8 bamboo skewers in water for 30 minutes. Mix all the ingredients except for the chicken together in a bowl. 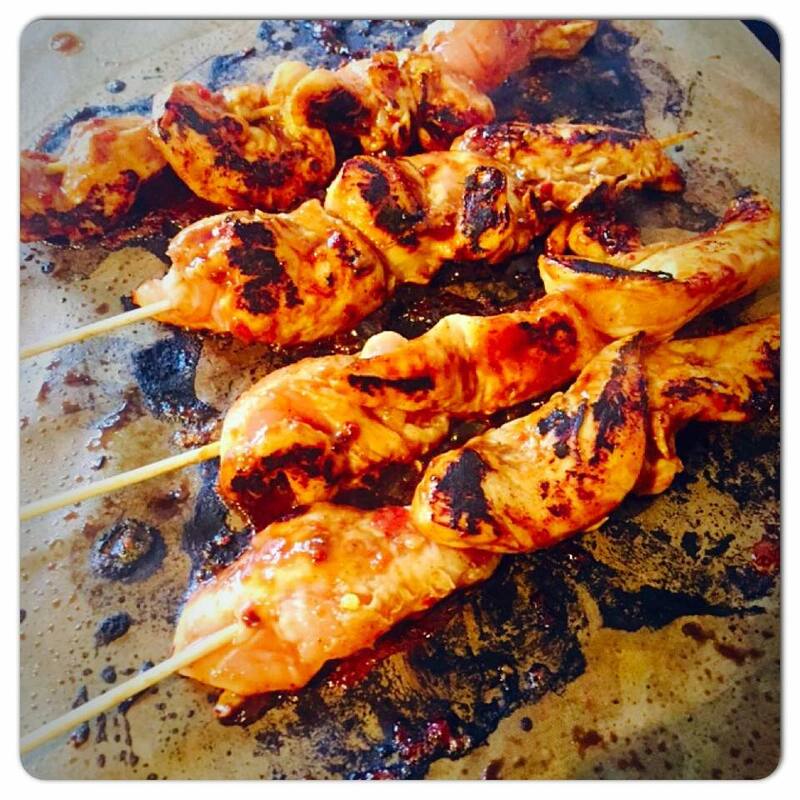 Thread the cubes of chicken onto the skewers, place on a tray and pour over the marinade. Cover and pop into the fridge leave for at least 3 hours for the flavours to develop. Place the chicken on a griddle or in a large frying pan and cook for 3-4 mins on each side, brushing with the marinade the until it's all gone. Cook the chicken until is cooked through. Wrap in foil for about 5 mins to let the juices settle. Pour the rice and water into a pan, bring to the boil, cook for one minute, now turn off the heat, add the chilli and coconut, cover with a tight fitting lid, leave until all the liquid is absorbed. Fluff the rice with a fork and add the salt to serve. 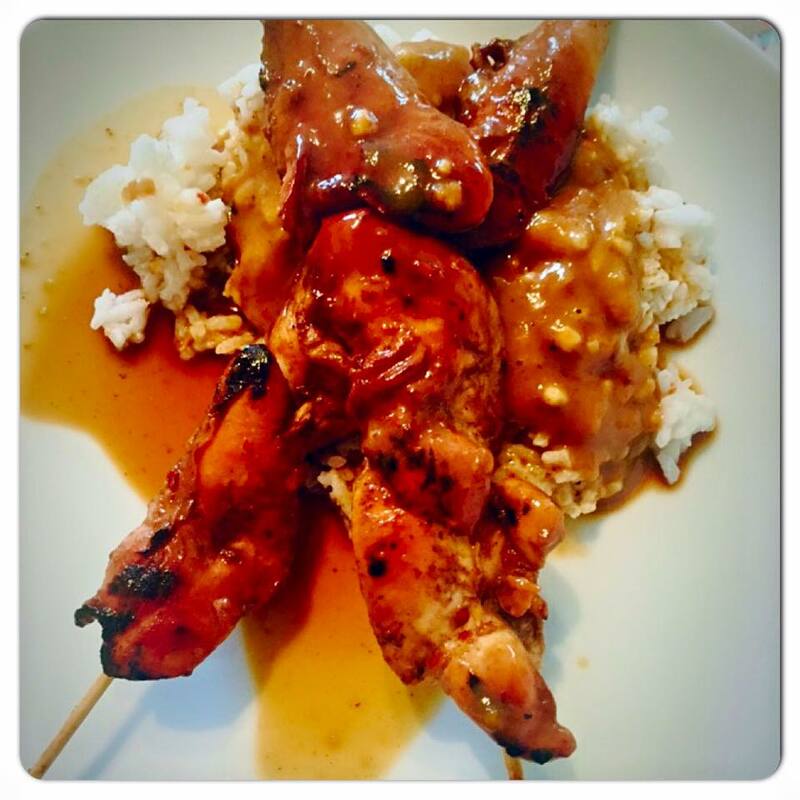 Serve 2 of the skewers per person on a bed of rice along with the juices from in the foil. Mine like a little peanut sauce and the ribbon salad on the side.